Kinetics Dance Theatre announces the kick-off of its 35th Anniversary Season with BODY, a not-to-be-missed evening blending professional modern dance, presented by Kinetics Dance Company, and celebration, with a program culminating in an anniversary reception connecting alumni, returning visitors, cast members, students and patrons. Woven throughout the evening will be a look back at a remarkable history. BODY will begin at 8pm on Friday, October 26th at the Jim Rouse Theatre in Columbia, Maryland, with reception to follow. We are sending a special thank you out to all of the volunteers that have helped build Kinetics into the thriving non-profit arts organization it is today. In recognition of such service, we extend an invitation to all volunteers of the organization, past and present, to claim a complimentary ticket at the ticket link above to attend the show as a guest. BODY will unveil a collection of compelling new work and returning repertory. Chasm, a new work by Artistic Director Lauren Tait, takes a hard look at division, real and perceived. The company is honored to present Baroque Business, by guest choreographer Rick Southerland, Associate Professor at Goucher College and President of the National Dance Education Organization. Tait will also debut Until Then, a sinuous and emotionally charged duet. Kinetics Dance Theatre alum and current Board member Jennifer Dorsey returns to the stage, dancing in her quartet, Mom:me. A poignant portrayal of motherhood, the piece peeks into a world where surprise and bursts of joy vie with repetition and tedium, and where caretaking of self and others fuse. Tait's Slant, a playfully dark movement satire about bias and sensationalism also returns. Finally, the Kinetics Apprentice Company, newly under the direction of Franki Graham, will join the program with a new work, Cascade. 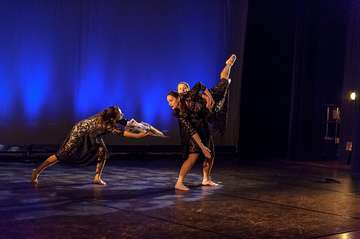 Founded in 1984 by Dorothy Fried, Keith Nichols, and Stephanie Simmons, Kinetics Dance Theatre embarked on a mission devoted to the development of contemporary dace as a vital art form within the community through performance, education, and outreach. Thirty-five years later, Kinetics is a vibrant body of artists, educators, learners, and patrons, with three parts work together to form a creative hub. Its professional company presents conceptually engaging concert work while also dedicating a portion of its season to free and low-cost family programming in local theatres, schools, libraries, and community centers. Its School of Dance, home to more than 800 students, emphasizes artistry alongside technique with a grounding in modern dance, a strong ballet program, and offerings in many genres for children and teens. Programs specifically for boys, for special needs students, for adults and for other specific populations bring dance to life for those of any gender, age, or ability. Finally, four student performing companies provide dedicated young artists non-competitive in-depth study, exposure to workshops and guest artists, and a wealth of performance opportunities both in-house and throughout the community. Are you a Kinetics alum or do you know someone who is? Former students, teachers, and company dancers, or anyone interested in reconnecting or keeping apprised of anniversary season events, are encouraged to join the event mailing list by contacting Operations Director Anna Martin. Kinetics Dance Theatre receives support from Howard County Arts Council through a grant from the Howard County Government, the Community Foundation of Howard County, Maryland State Arts Council (on the web at msac.org), and the National Endowment for the Arts.